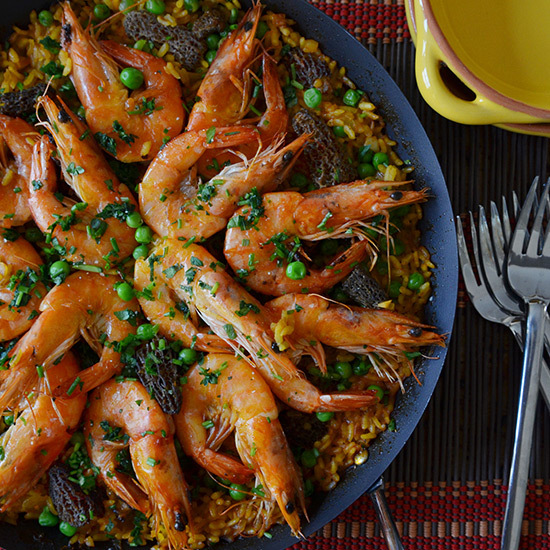 Andrew Zimmern’s quick version of classic paella, with earthy morel mushrooms and sweet shrimp, is done right on the stovetop. I love paella. It’s easy and more forgiving than risotto for the home cook. Paella is cooked over an open fire. I often do mine on my grill, over cherry and hickory hardwood coals. The crust develops superbly and the key to great paella is having the aroma and flavor of the fire convect into the open pan. That being said…for the past three months I have cooked paella indoors and while it’s not the same, it’s still an A-minus, and that’s pretty awesome. Celebrate spring with this delicious and easy Spanish classic. If you can do it outside, go for it. If not, you will still be thrilled.